Get excited—we sure are! Friday, May 6, is the opening of the 21st season of the USDA Farmers Market in Washington, D.C. 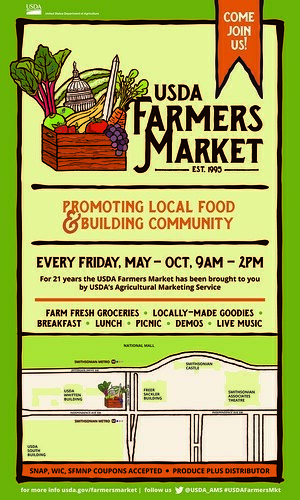 This means USDA employees and others who work nearby, residents of the city’s Ward 2, and tourists visiting the National Mall can once again shop at the USDA Farmers Market at 12th Street and Independence Avenue, S.W., starting next Friday, May 6, at 9 a.m.
We’re thrilled to have more farmers and growers participating than ever before. Farmers and growers participating for the first time include Chocolates and Tomatoes Farm and Spiral Path Farm, both of which are certified organic farms that offer community supported agriculture (CSA) pick up; EcoFriendly Foods, which has packaged and ready-to-eat meat and poultry products from animals raised without steroids, antibiotics, and hormones; King Mushrooms, which offers fresh varieties of oyster, button, and other mushrooms; and Stonyman Gourmet Farmer, which has small-batch, handmade cheeses and farmhouse foods. So Very Special, a local greenhouse and participant since the market opened in 1995, will return, along with C&T Produce, a vendor with a loyal following for more than 10 years. We’ll also have cut flowers from Bouquets of Loveville, small fruits and vegetables from Diaz Berries and Fruits, and grass-fed meat and eggs from Tall Cotton Farm. Selected from a pool of more than 100 applicants, the 32 vendors offer an eclectic mix of locally-produced options to enjoy for breakfast or lunch, as well as an abundance of fresh fruits and vegetables, bedding plants and herbs, seafood, eggs and meat, dairy products, baked goods, sauces, and more. Customers can picnic in the headquarters People’s Garden next to the market or take their purchases home to enjoy with friends, family, and even your pets. For 21 years, USDA’s Agricultural Marketing Service (AMS) has brought the USDA Farmers Market to USDA’s DC headquarters. This year, the market will be open every Friday, May to October, from 9 a.m. to 2 p.m., on the corner of 12 Street and Independence Avenue, S.W. Stay tuned for more details about the vendors selected for the USDA Farmers Market at Night, debuting on Friday, June 3, at 4 p.m. in the same location. The USDA Farmers Market at Night will run every Friday, June to September, from 4 p.m. to 7 p.m. More information about both markets will be available online at www.usda.gov/farmersmarket or follow us on Twitter @USDA_AMS #USDAFarmersMkt. AMS supports farmers markets in communities across the country through grants, research and technical assistance. AMS plays a key role in USDA’s Know Your Farmer, Know Your Food initiative, which coordinates the Department’s work to develop local and regional food systems. Under this Administration, USDA has invested more than $1 billion in more than 40,000 local and regional food businesses and infrastructure projects. See you on opening day! !